I have a new tumblr! 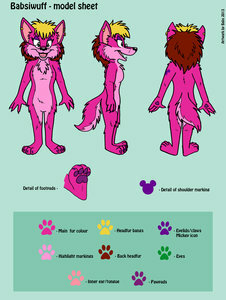 Wanna see what makes the pretty pink wolf tick? http://babsiwuff.tumblr.com/ Boom baby! Follow....ANNNND ask me questions! I may just draw the answer! This account is just a fursona account for me to play around with. In addition to art I've done of Babsiwuff, I'm also going to include art by other folks, and eventually, fursuit pics! I'm uploading it here since FA is still in read-only mode. By the way; I have to be at a church meeting after work Friday night. I might show up for Babstream very late that night depending on how long the meeting is. Hope to see you soon! It was really great meeting you at AC at the FPS show! hello, you going to anthrocon? *pounces the fellow wolf and gives her welcome lickings* Arf!